Using pool bromine sanitizers, instead of chlorine. A Popular Sanitizing Alternative to Pool Chlorine. Managing the Bromine level, of pool water!!! How to use bromine, as a pool sanitizer? Bromine pool water sanitizing has gained in popularity in recent years, especially in indoor pools and spas. While it shares a similar chemistry with that of chlorine, there are major differences in how the products are used in a swimming pool. Bromine is available in solid form and is very slow dissolving. Typically, it is used in a feeder specifically designed for bromine. Its main advantage over chlorine is the reduced odor and potential for irritation. Its disadvantages include: higher cost, not stabilized for use in outdoor pools, limitations of slow-solubility and requirements for larger-sized, specialized feeders. If problems arise, refer to the Pool Problems Page, as a source of problem-solving information, broken down into various categories. Scroll down the page and click on the linked keywords, catch phrases or images, in the archived answers below, to access additional information, on that topic or product. ► Bromine Test Readings Rise Over Time? Hello Alan - I have a ColorQ PRO 6 and I'm very pleased with it. My question: When testing the Bromine levels, the readings from any particular sample tend to rise over time. Sometimes significantly. Not sure if I should rely on the initial (lower) reading or the higher reading after waiting 2 - 3 minutes. Your thoughts? Thanks! Glad to hear, that you are pleased with the ColorQ PRO 6. It sure beats color-matching! The initial readings are the ones to use. The bromine oxides the DPD, forming a reddish color. If left to stand, the oxygen in the air, will start to oxidize the DPD and that causes the color to deepen, over time, suggesting a higher, but false, bromine reading. I hope that the information provided was helpful. ► Considering Switching To Bromine And Ozone? Hi Alan. I just read through a slew of your Q and A's, but did not find my question specifically. I have a saltwater pool that is just too much of a problem to run anymore. I am wanting to convert to a bromine pool with an ozone generator. Do I have to drain the water to do this or not? Thank you! It is not absolutely necessary to drain the pool. However, I am unconvinced, that switching to bromine will make things easier. Bromine will not last long, under the Arizona Sun, as it cannot be protected from being destroyed by the Sun's UV rays, as can chlorine. Adding an ozone generator, to what you have, will make things easier. The salt cell will last longer and the rise in pH will slow down, because you will need to generate less chlorine. I would start by adding an ozonator. The combination of a salt chlorine generator and ozonator really complements each other, producing better results and fewer issues. We hope that the information provided was helpful. ► pH Confusion And Non-Chlorine Shock? This is cut and dry!!! The pH with bromine should be 7.2-7.8. Higher pH readings will make the bromine less effective and could prove irritating. When bromine has done its thing, it reverts to bromide ions. Adding non-chlorine should convert the bromide ions back to bromine. It is an ideal product to supplement the bromine. Bromine can get depleted, by the Sun, much more so than chlorine. Adding a solar-powered, dual-ion, Purifier/Mineralizer, will provide some persistent, sanitation, for those times when the bromine level might have dropped too low. I hope that this information will be helpful and should set the record straight. ► High pH Problems And Bromine? It seems that the pH of my pool is always high. It started a few days after I switched from chlorine to bromine. Can that have anything to do with the problem? The water is clear, but the pH seems to be very high. I keep adding acid and testing, but nothing seems to be happening. I need some advice. The problem can very well be related to the bromine. However, the fault lies, not with the bromine, but with the chemicals used to test the pH. Bromine can react with phenol red (chemical used to test for pH) and form a purplish-red color that makes it appear that the pH i s very high. In fact, the formation of this color has nothing to do with the pH. The problem lies in the fact that the phenol red solution may not have had enough neutralizer (to prevent bromine from reacting with phenol red) in its formulation. This can lead to false high pH readings. You are using a bromine product that is acidic in nature and that should preclude the need for you to have to add acid reducers. Pools maintained, in this manner, will require pH increasers and total alkalinity increasers - never acids. I suggest that you bring in a water sample into a local pool professional, for confirmation If confirmed, you need to use a pH test that is formulated to work with bromine or add a drop of chlorine neutralizer (available in most pool stores) to the test vial, just prior to adding the phenol red solution. Now that we have established why the pH can actually be very low, we must take another step. The low pH could have caused corrosion. In order to avoid discoloration or staining, I suggest that you add a double of a Quality Mineral Treatment, such as phosphate-free, Liquid METALTRAP, prior to raising the pH or TA. I hope that I have been helpful. Good luck and enjoy the summer. ► Extremely High Bromine Level? I am getting an extremely high bromine reading in my 25 year old gunite pool. The only option I have been given is to drain the pool. Any other ideas? Bad option! Assuming that your bromine level is really that high and I'm not at all certain, it is not necessary to drain any water. First, I would have the water retested to be sure. If the level is way too high, all you have to do is to temporarily stop adding more bromine and add a chlorine neutralizer. Many dealers carry this product, which is meant to very quickly neutralize high levels of chlorine. In case the product does not have bromine neutralizing directions, follow the chlorine instructions and add 1/2 as much of the product. In any event, I would break the recommended amount into 2-3 increments and test after each addition. There's no point in overshooting the mark and having to add shock. In the future, adjust the amount of bromine being added to avoid a repetition. I hope that I have been helpful. How to get better results and reduce bromine usage. Use a backup sanitizer, to help assure better performance. 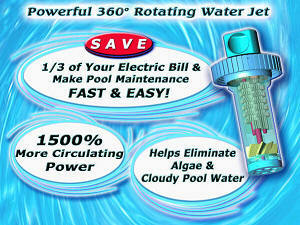 Adding an Ultraviolet Above Ground Pool Sterilizer will eliminate sanitizer-resistant microorganisms. A salt chlorine generator will produce chlorine, while converting bromides into bromine. A Solar-Powered, Robotic Pool Skimmer keeps the pool cleaner, while reducing chemical usage. Purifier, uses copper and zinc ions. For all types of pools. Eliminates resistant microorganisms and reduces the overall chemical usage. A salt chlorine generator can be used to maintain a bromine level. Removing the floating debris sooner will reduce chemical usage. 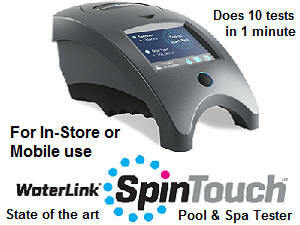 The Pool Circulator eliminates dead zones, improving sanitizing. ► Water Chemistry With Bromine Generator? If I have a Bromine Generator system it is salt that I have to test for correct? Do I still have to test pH, Alkalinity and Calcium Hardness? And what is the ideal range for all of these things if there is a Bromine Generator system? Do I still have to test for Bromine? Thank you so much for your help. Your website has been super helpful to me a few times. You have to add salt, to the level recommended, by the manufacturer. A salt test is required. You have to add sodium bromide, t o a level that is recommended by the manufacturer. As chlorine is produced, it concerts the bromides to bromine. The chlorine reverts back to salt. When the bromine has done its work, it reverts back to bromide. The cycle keeps repeating. Bromine has advantages, but it cannot be protected from the Sun's UV rays, as can chlorine. This could shorten the life of the salt cell. You need to test for salt, bromine, pH, total alkalinity and calcium hardness. Cyanuric acid does not have to be added, nor does it need to be tested. Test range for bromine is 3-5 PPM and for the other tests it is similar to a chlorine pool, except a pH as high as 7.8 is acceptable. Proper salt level is important. Too little and not enough chlorine will be produced. Too much could shorten the life of the salt cell. This use of sodium bromine and a salt chlorine generator performs better, in indoor pools. The reason this is so is because there is no Sunlight or UV rays, to destroy the bromine. PockeTesters are the easy way to test the salt level. Even tough the pool contains potassium chloride, maintain it to the same test reading standards, as if it contained sodium chloride. The new ColorQ water analyzers are all digital, use no look up charts and completely eliminate all color matching and guesswork. You will find ColorQ Testers for pools using Chlorine or Bromine, pools using Copper Ionization and pools using Biguanide. There's one just right for your pool. I hope that this information is helpful. ► Hassled Opening A Bromine Pool? I pray that you can help. I have so far found that owning a pool is a huge hassle and pool companies are not all that helpful. They just seem to charge me a fortune. I have a bromine inground pool and need to open it for the first time this year. I find that most information is geared toward chlorine pools. I would love to find a good source for helpful information like what chemicals I should purchase and what steps to take to clean and care for my pool. Can you please give me some guidance as to what to do. I would love a basic list of what chemicals to purchase, so that I can get ready. I can't seem to find any step by step care instructions for my pool. I also have a DE filter. Please help. Opening a bromine pool is just about the same as a chlorine pool. If the pool is covered, pump off the water and remove the debris. Try very hard not to let material get into the pool, as it will only add to the cleanup. If you are unsure about the possibility of iron and other heavy metals, being present in the tap or pool water, have a sample tested beforehand. Raise the water level and get the filter operating. Add enough shock, any kind of chlorine shock will do, as it will convert to bromine and raise the bromine level to 5-10 PPM. Maintain this high level until the water is free of algae and is essentially clear. Adjust the pH to 7.2-7.8, by adding chemicals as needed. If the total alkalinity is below 80-120 PPM, as chemicals to raise it into this range. Chlorine stabilizer is not needed. Operate the filter for extended periods, until the water is clear. Test the water frequently, maintain proper bromine levels and there should be few hassles. The right tester can be a real plus. The ColorQ Testers are all digital and there's no guess work or color matching. Good luck and enjoy the pool. My husband and I just had our in-ground plaster pool finished and are about to add chemicals. We are not sure which system to use... Bromine, Chlorine or ionization? We would rather go with something that is better for skin, we have a family member that is sensitive to Chorine. We use Bromine for our above-ground spa and like it, but have read that Bromine in a pool (ours is very large) in HOT (we live in AZ) does not do as well as Bromine. We want what will be most effective. Not to concerned about extra cost if better. Can you educate us on the differences and what may be best. I believe our pool will come with an ozonator. Thanks for your help. Assuming that your pool will be equipped with an ozonator, there are some good choices. Ozonators require a persistent, backup sanitizer to help keep the pool sanitized, as ozone's presence can be short lived. Ionization or a mineral sanitizer would ordinarily be a good choice. Ho wever, I believe that you might be better off avoiding this type of sanitizer for the first six months, in order to allow the plaster to completely cure. You have ruled out chlorine. Bromine has not been ruled out, except as related to cost. Bromine usage will be more expensive because of the heat and the strong Arizona Sun. However, the bromine requirements will be drastically reduced by the use of the ozonator. In short, the amount of bromine required, to maintain any given PPM level, will be much less because of the ozonator. Given the sensitivity issues, I would give this approach the first try. If it proves too costly, you could add a solar-powered, dual-ion purifier/mineralizer. I hope that this information proves useful. To better assure proper overall pool water chemistry, visit a pool store that has a very reliable, professional lab such as a WaterLink SpinTouch Lab, rather than a less accurate test kit or strip reader. Good luck with the pool. ► Using A Chlorinator With Bromine Tablets? I, too, am grateful to have found your site! You are now bookmarked forever! I have just replaced my liner on my 16x32 inground pool and have chosen to go to bromine as my chemical. I have been told by my dealer that a brominator is the same as a chlorinator, and therefore am in the process of buying and installing a chlorinator from them for my bromine tablets. Any reading I have done on this suggest that I am being misdirected and now need some intelligent advice. Sincerely. Unless that piece of equipment states that it can be used with chlorine or bromine and it suitable for a pool of your size, you are not using the correct product. Bromine tablets are far less soluble than are the popular trichlor products. In order to help assure that enough bromine dissolves, the brominators are larger in order to accommodate more tablets. Possibly, how the water passes through is different as well. You should only use a product that is labeled as suitable for bromine. Otherwise, there could be a safety risk and the possibly that you will not be able to get the bromine tablets to dissolve quickly enough to meet the demands of the pool. I hope this information proves helpful. Hi Alan, I am a new inground pool owner and am overwhelmed with all the products out there for sanitizing and for control of pH, algae, and so forth. I am using bromine products currently because that is what I received when the pool was installed in July. I really like the bromine compared to chlorine that my friends use and want to continue with it. Are all bromine sanitizers the same? Can I use another companies product? Can I use any algae prevention product with bromine, or are some only to be used with chlorine, and some with bromine products? I would ask my pool supply store, but not sure if they would tell me the truth since I wouldn't be purchasing the products they sell. Thanks. Bromine and chlorine share a similar chemistry. Compatibility is not an issue. All bromine, in solid forms, are not exactly the same. There are slight chemical differences that effect how the material can be made into solid shapes. These differences do not lead to any significant differences in the actual use of the bromine. In general bromine is difficult to tabletize and some tablets make keep from chipping better than others. They all work the same. The only chemical that you should not use is chlorine stabilizer, as it will serve no useful purpose in a bromine pool. If you're interested in doing more of your own testing, a ColorQ Digital Water Analyzer can do it without any color-matching or guesswork. I hope that I have been helpful. ► Looking To Save Money, Because of High Bromine Usage? Hi Alan, we just put in a large inground pool. We are going through bromine tablets like crazy. I pay $250 per 50 pounds of bromine. Do you know of a place I can order bromine cheaper? Thanks. I don't have any chemical pricing information. You can reduce your bromine consumption, by supplementing the bromine tablets with regular additions of a chlorine product or shock. For example, lower the settings on the brominator and add liquid chlorine to boost the bromine level. It will work because the chlorine will convert to bromine. As a bonus, you'll find the pH will remain more stable. It does work. The Sun's UV rays will destroy the bromine. By adding bromine and chlorine, after the Sun goes down, it will remain active, throughout the evening. Adding a Dual-Ion, Solar-Powered Pool Mineralizer will add backup sanitation and algae control, that last all day long. It doesn't eliminate the need to add an oxidizer, like bromine or chlorine, but does help reduce their usage. I hope that this is helpful. What is the best way to test for bromine in a pool? Thanks for any help you can offer. I would not suggest that you use any swimming pool test kit, unless it is specifically made to test for bromine! Bromine can interfere with the pH test and give a false high test result, if the pH test materials are not formulated properly or the bromine levels are very high. There are several different test methods in use. Test Strips have come a long way in terms of reliability, accuracy and the majority of them can perform the bromine test. The convenience and lack of liquid chemicals makes them a choice of growing popularity. DPD Test Kits are suitable for bromine testing. There are several ColorQ all-digital water analyzers, that would be ideal, for your needs. They are all digital and completely eliminate the color-matching and guesswork. I hope that I have been of assistance. Enjoy the pool. ► From Chlorine To Bromine? Is it possible to convert a chlorine pool to a bromine pool without draining the pool? If you know the procedure, would you please email it to me. Thank you. There really isn't anything that you have to do. If you add some sodium bromide, all of the chlorine will quickly convert to bromine. Otherwise, all you need is to keep the pH at 7.2-7.8 and the bromine level at 3-5 PPM. However, bromine cannot be protected from destruction, by the Sun's UV rays. Cyanuric acid helps protect chlorine, but there is no chemical that protects the bromine. You will find your operating costs higher, because of the destruction of the bromine, during daylight hours. Instead of giving up on chlorine, why not do it better? A salt chlorine generator is the better way to do chlorine, providing better control and results. Once you start with bromine, there is no turning back, short of water replacement. Good luck and have fun! Is it possible to use Bromine in the summer and Chlorine in the winter. My daughter's hair turns green from the chlorine and our eyes burn somewhat after long swim days, so I would like to use Bromine in the summer. The pool is not used much in the winter and I would like to save some money by using Chlorine we have an automatic feeder that says it will work with either. Yes!!! Once you start using bromine, you will establish a reservoir of bromide ions. Subsequent additions of chlorine will convert into bromine. I am not sure that you'll save much money. Once bromide ions are present, the chlorine consumption will increase, due to the fact that bromide is not protected against destruction by the Sun's UV rays. Green hair isn't necessarily due to chlorine. Have the water tested for copper. If you have a heater, it is a virtual certainty that you caused copper corrosion, as a result of low pH conditions. At the very least add a double dose of a quality metal treatment, such as phosphate-free liquid MetalTrap. The eye irritation can be due to high levels of combined chlorine. The ideal level for free chlorine is 1-3 PPM. Total chlorine should not be more than 1 PPM higher. The difference is combined chlorine. Make sure that you are testing for free and total chlorine. A product such as the ColorQ all-digital water analyzer, will provide a better picture of the state of the pool's chlorine level. 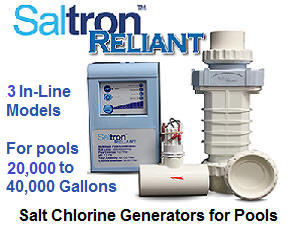 Have you ever considered a salt chlorine generator? It will provide better results, with fewer problems. I hope this information proves helpful. ► It Is Not Cold Fusion? I read many of your responses to questions about using chlorine shock in a brominated system and your answer has been: "When you add a non-chlorine shock to bromine maintained water it destroys contamination or converts into bromine. Guess what? The same thing will happen, if you use chlorine. It all ends up as bromine. Isn't chemistry great! " and "Because you are on bromine, any chlorine or non-chlorine shock will be converted into bromine. Isn't chemistry great! " Essentially you're saying chlorine (17 protons) turns into bromine (35 protons), but I'm not sure that is technically possible. Could you explain more of the chemistry of using typical chlorine or non-chlorine shock chemicals interacting with typical brominating tablet chemicals? Also, do you think it is possible for chlorine to end up as bromine, if there is no bromine introduced into the system? Chemistry is great! Thanks. You are not the first to bring this up. I am not advocating cold fusion! You are taking it too literal. By chlorine, I mean hypochlorous acid - the active form of chlorine in water. Bromine refers to hypobromous acid. If bromide ions are present, hypochlorous acid will oxidize it to hypobromous acid and the hypochlorous acid will be reduced to chloride ions. With non-chlorine shock, the persulfate ions oxidize the bromide ions and, in the process, are reduced to sulfate ions. This is simply an oxidation-reduction reaction. The confusion is in the use of the popular terminology for chlorine and bromine. I hope that I have clarified the matter. No cold fusion - not even close! Hello Alan! I'm a health inspector and I've been told of this situation below. A health club pool contacted a local inspector with an unusual problem: their ~25,000 gallon pool won't hold Bromine levels at all. Even after shocking, the Bromine level won't pass 4 ppm. The next day, the Bromine level is barely detectable. These folks are literally shocking everyday and spending a fortune. The pool has been in operation for 18 years, and this problem started approximately 2 months ago. I've quizzed the manager on what, if anything, changed 2 months ago in regards to the pool/pool operation, and nothing jumps out. The brominator has been replaced. The pool has been shocked, super-shocked, etc. pH, Alkalinity, etc. are all monitored and in range. Their usual brand of Bromine has been replaced with another brand, test kits have been swapped out, etc. UV doesn't seem to be a cause. The sand filters have been checked and, if I recall correctly, the sand has even been replaced. Any ideas? Thanks! There is no simple answer, as you have concluded. Very high bromine levels will destroy the testing chemicals, especially DPD, and could yield erroneous low results. A more likely possibility is that the pipes and some underwater water surfaces are coated with biofilm. This would consume bromine, at a higher rate. I suggest that liquid chlorine be added, until bromine level is over 10 PPM. Keep it elevated, until there appears to be some modicum of stability. From the point forward, it should be easier to maintain a normal level with more modest chemical additions. Urine is the worst contaminant, in terms of bromine concentration. Is it possible that some new users are subjecting the pool to this undesirable situation, through lack of proper use of rest room facilities. Good luck.